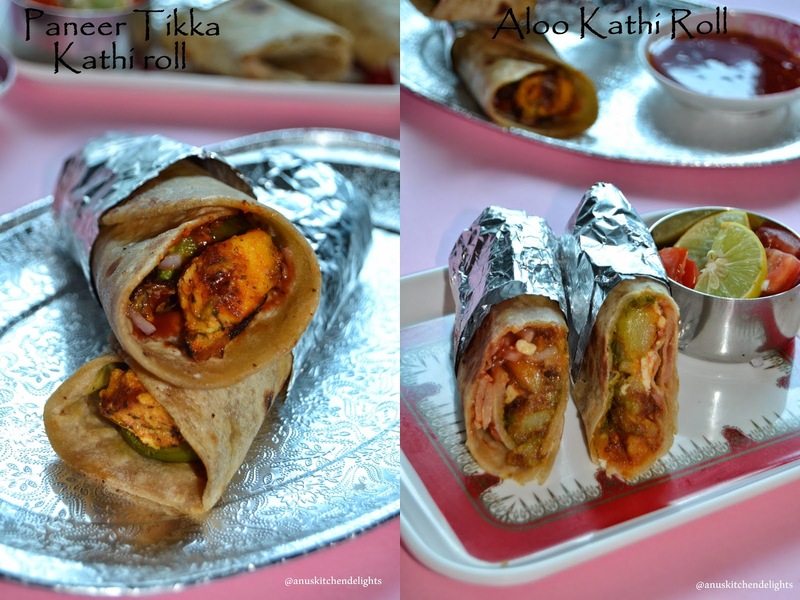 Kathi Rolls or otherwise wraps/frankie's is a popular street food, originating from Kolkata, India. Over years it has undergone many variations and is now almost available in every cities. They are prepared with whole wheat parathas stuffed with various fillings. Perfect to go as a meal for any time or as a snack. Last time when i was in India i saw it in nilgiris, but didn't get a chance to taste it. Should try next time... So i googled to find out the recipe to prepare my own kathi rolls. It's easy and, simply you can make your own filling as an evening munch for kids. I actually planned to prepare only aloo kathi, but i had some paneer left in my freezer, thought to put use of it too. So here comes the recipe..
Ghee/ Butter - as needed to cook parathas. 1. Combine all the ingredients and knead to a soft dough. Set aside for 20 mins. Divide the dough into 7-8 equal portions. Roll it slightly thick. Heat a tawa and cook the chapatis lightly on both sides without browning too much. Set aside. 1. Pressure cook the potato for 2 whistles until done. Peel it and roughly cut into cubes and keep aside. 2.Heat oil in a kadai and splutter cumin seeds and add the potato. Throw in the chili, turmeric, dhaniya, chaat masala and salt. Fry for a couple of minutes and mix well. 1. Combine all the ingredients under marination in a deep bowl. Add the paneer, tomatoes, onions and capsicum and toss slightly. Set aside to marinate in refrigerator for 15 mins. 2. Heat oil in a non-stick pan and the marinated paneer mixture and saute over high flame for 2 mins and reduce the flame to medium and saute for another 4- 5 mins. Flip sides by gently tossing the pan or turning them until all the sides are roasted and turns golden brown. 3. Remove from flame and start making kathi rolls. 1. Gather all the ingredients for arranging the kathi roll. Take a chapati, spread a tsp of green chutney first, either on the center or towards the bottom. 2. Then top it with aloo filling, cheese, ketchup, chopped onions, and finally coriander leaves. 4. You can apply maida paste or apply cheese towards the end, so that it can hold tightly. 5. While serving, toss the rolls on tawa till it get warmed up and serve hot. Follow the same procedure for paneer tikka stuffing also. Alternatively you can wrap it in an aluminium foil or butter paper and pack it up. At the end you can sprinkle some chat masala on the rolls. Cheese is optional but the rolls in saw in nilgiris , had cheese in it. You can also make the chapathi fully with maida or half and half. Roll it slightly thicker so that it can hold the filling or else it my tear. Labels: Break Fast & Dinner, Snacks Starters & Chats. kathi roll looks delicious Anu my favorite.